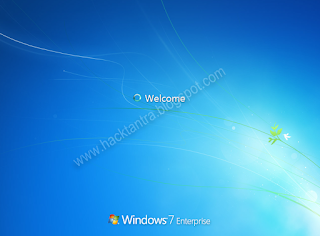 Windows 7 installation step by step explanation is here with screen shots.Many of you have used computers for many days and also using Windows 7 as an operation system, but yet don't aware of the installation of operating system for your computer. 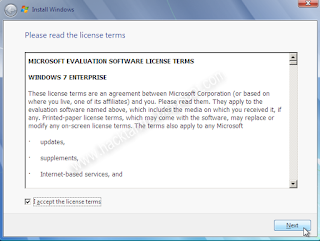 In this post I am going to mention step wise installation of Windows 7. Many get afraid whenever format word come. As we know everybody love his computer/laptop so anything harm to our computer it’s really hurt all of us. If anything wrong happens to our computer and we have to format it than we became sad and start thinking that formatting means losing all the data off your hard drive. Unfortunately, if all drive is infected with Virus than you should format the whole Hard disk but still I prefer not to Format your PC because it’s not an easy task to back up your lost DATA. Yes you will lose your Data but not the complete hard disk Data. If your computer is having three drives naming C D and E and operating system file is present in C Drive than it might be not necessary to format the rest drives D and E. So you can save all Data present in D and E.
Unfortunately, if all drive is infected with Virus than you should format the whole Hard disk but still I prefer not to Format your PC because it’s not an easy task to Back up your lost DATA. If your computer is having three drives naming C D and E and operating system file is present in C Drive than it might be not necessary to format the rest drives D and E. So you can save all Data present in D and E. So you can save all Data present in D and E.
I prefer not to format your complete PC instead you can follow Steps mention here. 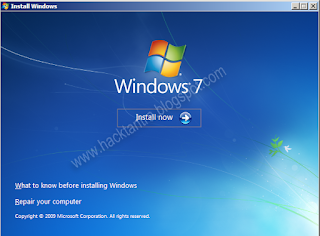 So if still your problem doesn't solve after following the steps mentioned in link or anyone want a fresh installation of windows 7 than here I am going to mention you steps followed to FORMAT your system using Windows 7 bootable CD/DVD. Step 1. The first step should be you have Windows 7 bootable CD with you. Now insert this CD into Your DVD/CD drive and reboot your system. Step 2. As soon as you reboot a message as shown in below figure should appear. Than you have to press any key without delay. If you not seeing this message than you have to manually change your boot order by pressing function key just after restarting your computer and select option boot from optical CD/DVD Drive. *NOTE for different computer the function key may be different it may be F9 in some cases or F2 in another. It’s better to watch your computer screen while it booting. It shows the option down there at right or left corner of the screen with the message, press F-x key for boot menu. Now the next screen will come is shown below. So now you have to wait for some time until the OS check all drives and configuration of computer and start copying file to your local drive. After this you will be encounter the below screen. You have to just press next button here. Also accept the user agreement by applying Tick mark in front of check box. Now drive option will be shown in front of you. Installation process ask you that in which drive you want to install your OS. Note: - Here you can create new drives and delete old drives. Just Click on the Drive option Link shown there. 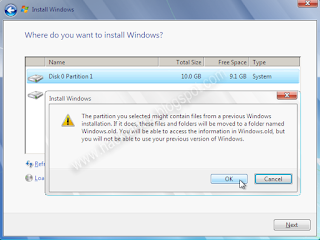 You can create a new partition by clicking a new link present there and then allocating the desire size to it. You can format the any drive by using format option. 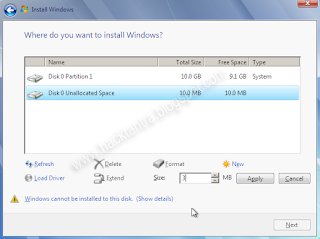 Similarly you can delete any partition by clicking on the delete button. Select the correct drive from shown drive and then click one next button. You may be encounter with this dialogue box after clicking the next. Click OK and proceed. 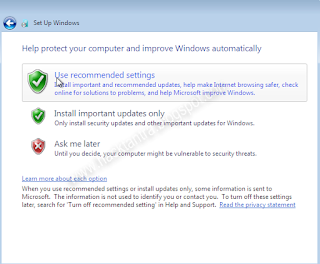 After Pressing OK to above the below window will appear and your installation will start wait for few minute (20 Min approx.) and then your computer will restart automatically. After the reboot the computer will automatically continue with its installation. You don't have to do anything during this. So wait until the next screen come. 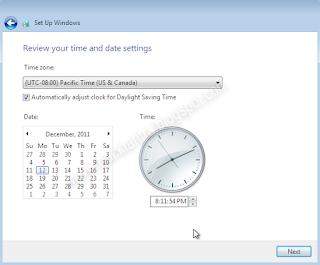 Wait for few time until the computer restart and window show below come. Fill the name of your computer and proceed. You will be soon show the welcome screen. 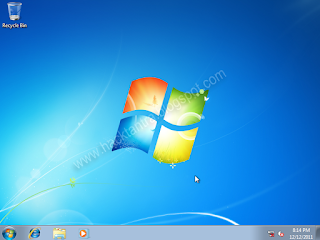 Congo you are successfully install your operating system. Thanks for reading my post. 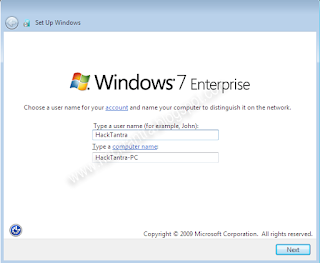 Hope you like this post on Windows 7 installation step by step explanation. 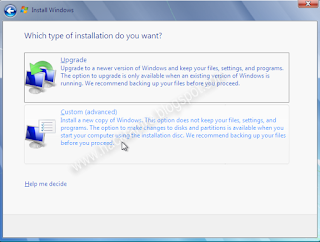 Please excuse us about low quality images.Windows 7 installation step by step.